Berghaus' Explorer Ridge GTX is a solid 2/3 season leather walking boot which I've been wearing pretty regularly over the last 2 months or so for a variety of Peak District walking. And I must say that they've been extremely comfortable right 'out of the box' no matter what the conditions. The sizing may be a little on the small side - I've been wearing a half size bigger than normal and found that these were a great fit with my usual two pairs of socks. Overall my feet have been very comfortable throughout some very long Autumn day-walks over typical Dark Peak terrain. And they've definitely been waterproof - even in clingy, boggy conditions. Although not officially crampon-compatible, I think there may be just about enough stiffness in the sole to allow occasional use with flexible crampons. So far they are wearing well and so appear to be quite durable. 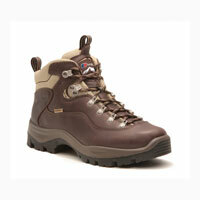 The Explorer Ridge GTX is a good option for a regular peak district or lakeland walker. They may also suit an occasional munroe-ist as well.